Published February 24, 2014 By Leisa Good This post may contain affiliate links. Regardless, I only recommend sites I've researched and/or used and trust. Would you like to work online for a trusted offline company? Did you ever “temp” when you worked in the B&M (brick and mortar) world? Do you believe you have the skills and self-discipline to work from home? Then signing up for Kelly Services online might be a good option for you. What Exactly is Kelly Services? Anyone who has ever worked as a “temp” probably would recognize the name. They are now a global temporary staffing service in 36 countries serving a variety of professions such as healthcare, law, information technology, financial, and engineering. Founded in 1946 as the brainchild of William Russell “Russ” Kelly, the company started under the name of Russell Kelly Office Service. The company grew as it took on the typing needs from local businesses. As the company grew, Mr. Kelly would often loan his secretary to a company for the day. However, more and more companies began calling and wanting other services such as payroll and bookkeeping. Mr. Kelly saw the need and began hiring other women and loaning them out to companies to do more and more office work. Hence the name, Kelly Girls. In 1966 as the workforce became more diverse and the company grew again, the name changed to Kelly Services. Now, enter the day of the global economy. On December 12, 2012 Kelly Services and Odesk (now called Upwork) teamed up to create what is known as KellyOCG®, which is the Outsourcing and Consulting Group of Kelly Services. This was to help bridge the gap between online freelancers and offline independent contractors allowing them to collaborate under one platform. However, Kelly Services also has its own work-at-home (WAH) site. While Kelly Services still continues to post work at home phone jobs on such sites as SimplyHired, Monster, JobHat, and many others–the majority of work-at-home jobs will be found on its own work-at-home web site or Odesk. What Does a Kelly Services Online Temp Do? Obviously, it will vary from job to job. There are administrative positions and customer service positions, as well as even gaming advisor positions. It will depend up which one of the many work-at-home positions you will apply to and be selected. What Are the Hours and Pay at Kelly Services? The hours and pay will also depend upon the position. However, I am happy to report that the starting pay tends to be a little higher than other work-at-home jobs. The pay tends to be more in the $10 to $12 an hour range than in the $8 to $10 an hour range like many work-at-home jobs. Most–not all–positions tend to be inbound and outbound customer service positions, but even that is changing. The pay is also weekly for most all of the remote positions. Are You an Independent Contractor or an Employee at Kelly Services? 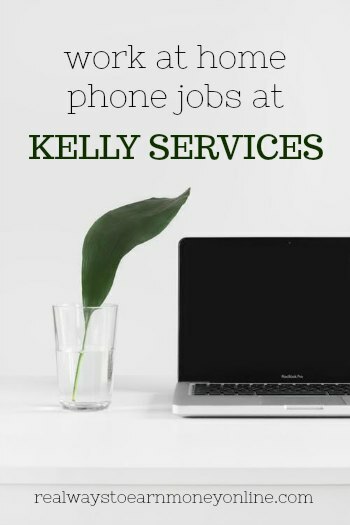 All remote workers of Kelly Services are considered employees and are eligible for the same benefits as employees who work at traditional customer locations. Also, if your performance remains good you may transfer to an offline position in your area in the future should one become available. What Skills/Special Training Do You Need to Work at Kelly Services? The following skills were actually posted right on their website. What is My Overall Impression Kelly Services? What can I say? They have been a leader in the temporary staffing industry since 1946 and are now a presence in the work-at-home industry. Any company willing to do that definitely has impressed me, and I hope more will follow their lead. How Can an Interested Applicant Apply to Kelly Services Work-at-Home Positions? You will have to go to their work-at-home site. There you can click on the “Find a Job” link to create an account and post your resume. You will need a valid email address and a login and password that you create. You will also need to set up your search, so that email job alerts may be sent to your email address. Good luck to all who apply. You can also “Like” them on their Facebook page, at https://www.facebook.com/kellyservices. If so, you can check out our remote job leads board. And for even more listings, Real Ways to Earn recommends a subscription at FlexJobs. They post hundreds of flexible and remote positions weekly, guaranteed scam-free. The subscription is $14.95 a month, but they make it really easy to cancel at any time if you are not impressed. @Alisha – You can always sign up for an Odesk account and search for them there. @Bernice – LOL. Trust me. I know all about those search filters. You don’t want to know how many attempts it took to finally find their work-at-home site. So many searches only bring up their offline jobs on JobHat, Monster, GD Jobs, etc. Back in the day, I worked for ManPower offline only and some of the government-type contracts had a much different application procedure. I am sure there are similar scenarios for Kelly Services and the type of job, location, and type of security needed. Thanks for all the great and engaging comments. Oh another thing I forgot to tell everyone is when on their job search page, take out the work at home that is in the keyword area of the filter. if you search with the keyword “work at home” nothing usually will show up. Instead do a search without any filters and after the results show up go to the filters on the left side and click on “flexible arrangements” you will see a “work at home” in the drop down. Check that one instead. Then the work at home jobs will show. @Beckie When you are not near a physical location they allow you to fax the paperwork in. This is what I did. @Alisha I technically work for Kelly Services but I never had to apply through them ever. Nor do any other people that work for my company. So don’t just go by their website. My current position does all their own hiring etc. but then you get paid by Kelly Services and they also provide us benefits etc since they are technically our employer. There are several major companies that hire WAH people that use Kelly as their payroll and employer of record for people. But they do their own interviewing and hiring etc. So don’t give up and you may be surprised when you do get accepted for a position and then are told to turn in all your paperwork and payroll info to Kelly. Thanks for the information Anna! When looking through the site, under the hiring process, it does say you have to go to a physical Kelly’s staffing office to sign your I-9 forms in front of a Kelly’s staff member. This could hamper some that may not have a local office. Still, it’s nice to have a place like this out there to help even more toward finding at home employment. @Cheryl – I agree! Anna is awesome! @Alisha – Yes, Anna is right! Don’t get discouraged. Try going to Odesk! Do you have an account? Kelly Services has posted a few awesome jobs on Odesk. Check there too and check often. @Beckie – Yes, this isn’t uncommon. Many times a virtual company will have you come in and fill out paperwork at the local headquarters or even appear before a notary public. So, not totally uncommon. Especially from a company as big as Kelly Services, because remember this. You are an employee, and if you choose to transfer from at-home to a regular location, you will continue with your benefits and pay. Thanks for reading that and sharing! @Lisa I’m new to odesk. How do I look up work that just Kelly Services posted? I went to the website and clicked on the link for work at home. There isn’t anything listed. I think what they have available fluctuates. Some days they have things and some days they don’t. I’ve seen jobs posted there before, so try checking back tomorrow or the next day and see if anything is posted. Well I have to give credit to Leisa Good for this article. She did all the research and wrote it up for me. She’s awesome! I am so glad it helps, Cheryl. This is a company that it’s been on my list to review for a long time.